Last Thursday morning, our community's Guru, Bariles, texted us to join him in a rendezvous in GenSan's new resto right in the very corner of where usual city gatherings are held. We right away, confirmed our attendance. Busy picture taking and surfing! I still had my classes until 7 pm, so my sister, Tammy and partner, waited for me to finish my work, and we headed straight to this new place. The resto was so welcoming with its very wide reception area. We spotted the group and the stories were endless. We missed their previous gathering in Grab a Crab, but, we enjoyed the night with the sumptous meals of Genee's. We wondered where they got the name from "Generals," referring to the people of Gensan. But, since the word connotes a masculine tone, they named the place Genee to sound sweet and relaxing. They hold beautiful pictures of the Generals, and I felt like I was in a museaum! The place has WIFI services, so we had the chance to dine and surf the net.COOL!!! We got to meet other bloggers who unfortunately missed the MBS2. Our beloved Bariles laid the possible gatherings for the community and we were all that enthusiastic to hung out again in different occasions! We sure had great fun at Genee's and will surely come back and ask our friends and family to check this new place! This resto makes us even more proud of our city! CONGRATULATIONS to the staff and management of GENEE! My husband and I have been lovers when I was only at Grade 6, and he was on his junior high school when we were still in Zamboanga City. I was all pretty shy then, but he indeed pursued me well. But, when my parents knew this, I was cut from his life and was fully guarded to-and-from school. 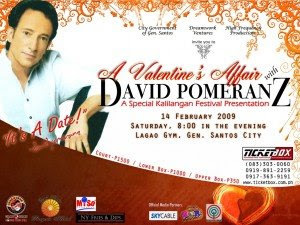 I only had the songs of yesteryears, particularly of David Pomeranz, to reminisce the happy moments we had together. Every day I would wish that I would bump into him. That wish was granted when we were back together when I was already on my sophomore secondary schooling. But fate indeed tricked us again and we were parted by distance since my family had to relocate for good in Gen. Santos City. For four years, we lived through distant relationships until we separated our ways again and fall for someone else. In spite of our individual relationships, I could only recall his vivid face on my memory and the songs we both loved. After five years and our third separation, he went to see me in GenSantos City and asked me to marry him, I just said YES without second thoughts! One of the songs we both love that bound me and my hubby through separations was Pomeranz' OLD SONGS which I luckily grabbed from Youtube.com. And, now through the blog contest of Bariles, I had known that David Pomeranz will be holding a concert on Lover's Day and one of their cool sponsors is Grab a Crab, where we happened to hold get-togethers with very great food with melodramatic and elegant ambiance at unbelievable prices. I really hope to be in his concert and relive every piercing love song he had written and sung and personally thank him of how he inspired us couple to live through and found one another again. I always appreciate his songs. His lyrics speaks truly of love, hope, and dreams that I can't help but reflect on how a man's songs could actually speak through your heart and dig into your soul without an effort. This concert is indeed a worth-giving gift to a loved one on a very very special day. I only wish it could be my very gift to my husband. Tomorrow is Friday and it means, I can lay low with my lectures and works and prepare instead for my masteral classes during the weekend. Do I call this rest? Hahhahaha, this is indeed rest already. I just consumed my late afternoon earlier watching a kid's movie with my son, and just enjoyed my snacks with my family. This is indeed one of the things I crave lately, fun, family and rest!!!! We shall however consume our day tomorrow in school for a research talk. Hmnnnn, I rather wish I shall be somewhere else but there.hahahhahah! But, thank God it is Friday again!Yepey! Who does not take pictures in occasions like birthdays, weddings, births and even deaths? We seem to bring our cameras everywhere we go. My family and friends, here and abroad have large bulks of pictures from their old cameras of films and digital cameras. I can see stack of albums in every room for special occasions or otherwise just to capture that happy moments with family and friends. I can see even very old pictures whose papers have been dilapidated by time and use. Some good pictures are actually torn if not scraped or tampered. My family had to scan their old family pictures of 1940's and 1960's since they were worn out already. I could feel their sentiments as the pictures could not really be fully restored. I wish that digital cameras have come as early as those years.Then, it would be more fun! But with technology's pace and advancement, we have digital cameras at very affordable prices. But the thing is, we just keep the pictures in their storage disks or print them. We have to skim over the pictures through our cameras and shift between storage media just to see the older pictures. I then asked my family if we could find a way to keep our digital pictures intact and for posterity. I right away checked what are the latest media for digital pictures. There I saw Ceiva digital photo frames where I can upload pictures through emails or phones and cameras. I can then share all these wonderful pictures anywhere in the world with so much ease. More importantly, they have this PicturePlan where I can store all my limitless pictures and my family's and see them through a slide show. I can even customize these pictures and send them as post cards to to distant friends and relatives. Further, my friends can send through these great frames their pictures for free! These frames provide security that only my friends and family can send through the pictures. So, pranks and unwanted senders are actually blocked. All I have to do is set my security feature on and connect the digital frames through phone line or WIFI connection should I go out from the house and bring this special frame with me. With this frame, I can wake up each day and reminisce all the special moments from yesteryears. How much is this unique frame? The company has a new special offer of $29.99 with one year subscription of PicturePlan and they offer free ground shipping. Now this is worth every penny. I shall indeed recommend this to my friends and family. Before 2008 ended, I had been hearing global financial crisis. But, here in the Philippines, that seems to be so natural since we have been crisis since time memorial. Is this comforting enough for the government or even for us, Filipinos? Now that 2009 has started, we are bombarded with more discouraging and dismal news of job unemployment like from Intel's closure where 20,000 Filipinos are sure to be unemployed. Then, to add some salt to injury, our government is telling us that there are jobs for these unemployed and for the coming graduates. Then, how come, we are considered 5th hungriest nation in the world? I could only feel sorry for other Filipinos who are jobless and hopeless. Now, we can only hear more aggravating news like more bank and company closures, Ebola virus, pre-need insurance scams, politicians' bickering and extended- but- compromised college education. I wish the politicians and Filipinos will really unite so we can rise up fully from all sorts of crises. I have been working late on EC dropping, checking of students' papers and Java programming. And, after all these short-in-sleeps nights, I have to wake up very early so I can go attend to my classes on time. These are now my routine works since I chose to continue my masteral schooling this second semester. We don't have our Sunday classes anymore, so at least, I have a day's rest to recharge for a long week again. Tsk!Tsk!Tsk! My request for dropping my subject load didn't go through since there is no available teacher to take my post.waaaaaaaaaaaaaaah!!!! I could only pray for insanity! What is Your Barbie Moment? When my sister and I were kids, we were never really given Barbie dolls instead, we were given robots and other boy stuffs. Seldom that my parents would buy us, or me particularly some good dolls. But my friends in the neighborhood would play with us and their Barbie dolls. I could only envy them. So, I asked my parents to buy us too but with harder life at that time, Barbie dolls seemed only for the well-off. I only cried out loud since I could not have it! But, when I grew up and started working, my passion for Barbie dolls was unabated. I would always go to the mall and Barbie's section and wonder and praise the beautiful collections of dresses and Barbie doll varieties. I wish to have one and play it with my kid. But since I have a son, I could not at all buy him these. So, I played with my little sister in-law, and dressed up the Barbie dolls she had. It was a great time with her but I still wish to finally have my own Barbie doll for collection! I could only be happier to see this widget through Social Media Network. You can get your own widget here and view it yourself. I praised the talented girls the CosmoTV featured. The girls can indeed inspire everyone to follow their dreams. I enjoyed watching Amy Poehler and the ladies interviewing the young ones. They indeed enjoyed every minute with them. The show is a great avenue for these youngsters to be exposed and to be inspired to go on with their love for music! For sure, the other youngsters would be inspired to make their talents exposed and harnessed. Barbie should be complimented too for putting up this show. Their need to showcase these talented and smart girls is a big plus! Barbie inspires not only the young kids but even adults like me! Kids and adults should not be wealthy to chase their dreams! These talented girls are proofs that anything is possible when you just believe in yourself. This is one happy time with my kid, wordless but having him by my side makes my day recharged and fulfilled! We are just sisters in the family with my parents. We seemed to be the average-sized family, and when we started leaving the house for school and work, the house has become quite lonely. There was a time, only my parents and my youngest sibling were left at home,as the elder siblings were all out of town. But, now that we all came back except our third sibling and with my kid and my sister's, and partner, the house has became frantically wild.Each morning has become a yelling time so the kids would move and prepare for schools. Hahahahahahah! We may have a small house but I would never want it the other way. I love my family and my time with them in spite of everything. Cheers to family and life! I am a teacher for over a decade and one of my problems is to get the attention of my students without the usual disruptions. I normally connect our subjects to real-life situations so they can clearly comprehend and visualize the lessons. I ask them of their good or bad experiences, so the entire class may learn from actual experiences. Some students really show their interest to learn while others are as passive. This is also the problem I get from my kid and nephew while I guide them through their preschool classes. Their attention span is actually so short that I keep on looking for ways to help them more and to make them appreciate learning at their young age. Two of my strategies are stories and books filled with funny and interesting pictures. Truly, my kid and nephew remember well the stories and scenarios with them. Thus, I constantly search for materials and ways how I can help them learn more and be ready when they shall enter into formal education. I never appreciated school before, particularly science, because I got bored. But, when my old school brought us to another school's open house and museum filled with preserved animals and babies, I began to appreciate the subject better and dreamed of wanting to become a doctor and a teacher!!! Good thing that there is a Grossology Exhibit - Orlando Science Center that can help youngsters and adults to learn more about science, the impolite and funny way. This is a hands-on and a colorful exhibit for everyone about health and biology. Normally, students find science and health topics boring, but through the exhibit on January 31, 2009, the kids can see, learn, and have fun with animatronics and inventive exhibits that disguise learning through gross stories about colds, body odor, body anatomy and more! I can already anticipate the unique learning the kids will get from this exhibit. This is in partnership with Science World, Advanced Exhibits and the well-known Grossology author, Silvia Branzei who hosted the successful Animal Grossology in 2006. The exhibit at Orlando Science Center is guaranteed to bring fun because we can try and test our Grossology knowledge through various trivia activities and games. We can have great time too by climbing the human skin rock wall, moving down through the 30-foot slide, or meeting Nigel Nose-It-All character who teach about allergies, colds and stuffs! Who can say now that science is boring? Orlando Science Center holds too a lot of learning exhibits, from nature works, dinosaur finds, and laboratory technologies to space experience. This place holds it all. This is indeed a seat of learning where every visit is sure to be fun-filled! I will surely ask my family in Wisconsin to watch this exhibit and I am sure, the kids will remember this great place! As an IT masteral student,teacher, entrepreneur, writer, adviser, mother, wife, blogger, finally decided to ask my boss to drop one teaching subject I have and my school publication advisory so I can rest a bit. I am indeed missing a lot of fun, sleep and my kid is deprived again! I am enthusiastic and passionate with my works, but my body is complaining already. My head drums a lot and the back is consistently with excruciating pain. I know I really have to rest, and do my jogging routines to help my back. But, I can't really have these done, as every minute has its valuable task appointment.waaaaaaaaaaaaaaaaah! I really hope my boss can finally find a substitute teacher for my class otherwise, I am left with no choice but to finish this semester with 33 hours of teaching subjects! Tsk! Tsk! Tsk! The weather is getting cranky again. It indeed shifts to very very hot weather, then we get to have rains on late afternoons or the next day. Now, my morning allergy becomes difficult as it persists until the end of the day. Sigh!!!!! I don't get to sleep much too because of my works. This has contributed to my dilemma. My nephews and kid are having cough. Goodness, we seem like carolers and crying babies with all the sniffs and growl.Hahahhahahah! I hope that we all get better soon. As an educator, I have to find means to help my students learn, through typical lecture or otherwise. When I started blogging, I was elated that I can meet friends, learn more and earn extra. So, I taught blogging to my students that they may appreciation what a blog can do. With the lectures we have in the classroom, I get to ask them to use the internet resources to complement the lectures and use their blog to present their works.Hahhahahahha! Some students would just stick to answering their assigned activities while others are that creative to make their blogs presentable. I get to know them more especially, those who spill out their heads and emotions on some issues I normally present or voluntarily they would provide. Hmnnnnn, this is one interesting side of teaching that I will always love! I wish that I can teach them how to write XML and HTML code so they can improve their blogs. Now, that is one vision, I wish to eventually solve. Perhaps, when I have the time. . . .
Having a home in a remote place with neighbors so distant and unattached, we decided to buy our own guard dog. Our first pet was a dalmatian but when she was one year old, on Christmas Day, we found her dead and bloody. She was a very sweet dog and would always welcome people even strangers. This I think is a typical trait of dalmatians. So, when she died, it indeed scared us a lot. You see, we had our neighbors who were robbed on different occasions. Thus, we wanted to be more vigilant. We decided to buy a more protective guard dog, and we have a German Shepherd, named Gia. We got her when she was three months old. So she could not eat seafood and trash, we leashed her but that made her so aggressive. As she gets older, her bark gets louder and stronger. Our guests would not at all come near her because, she could jump on anyone easily without warning. She is that scary that she had ripped apart and eaten whole the puppies of our native dogs and her very own puppies when she gave birth. Thank God, that until now, no one had dared to trespass our land, and our home! So, when I saw this contest for pet pictures, I easily uploaded Gia's picture. The site not only allows me to boost my pet but it allows me also to win as much as $500. I created my account in a flash and easily uploaded the picture. I had the chance to see too other funny pet pictures! I had the chance too to read some 101 Home Selling and Staging Tips. And since, I am into entrepreneurship and business opportunities, the tips indeed help a lot for any amateur or professional home seller! Energized Seller is a community of home sellers who innovate their homes so they can be sold quickly at higher rate. The community is composed of professional home sellers who give practical advices and insights on how to improve your home and make it marketable. They can help you with any home-selling issue and concern. More importantly, the registration is free! Now, why don't you check it yourself to believe! When I started to receive paid reviews, I would always love to blog and keep on blogging. Somehow, even if this blog doesn't have its own domain name, at least, I get to write paid review once every week or every other week. But, with global financial crisis, waaaaaaaah, opportunities are at dismal rate and frequency. Tsk!Tsk!Tsk! I really hope things would be better, esp. in USA, where opps would usually come from. I am indeed keeping my fingers and toes closed.hahahahah! I am more than 30's already.waaaaaaaaaaaaaaaah!!!! I love my age anyway but I somehow envy the young ones who seem to enjoy their age and their enthusiasm for life. I never really enjoyed my younger life. So basically that is the reason why I want to do a lot in spite of my age. Late bloomer indeed! Hahahahhaha! I am into mountain climbing, outdoor sports to include war games, business and parties.Hahahahahha! I can say it is never too late to have fun with friends and family. Unlike years ago, I treat my teaching career as only a secondary passion. I feel more alive when I design accessories and think of ways how the store can do better in spite of economic crisis. I am enjoying my time too with my kid. He is one of the many areas in my life who lack attention. I am decided already to stop schooling this summer so I can recharge for the next semester. Hehehehe! Probably, after this rest, I may not continue my masteral schooling anymore and just travel abroad. WOW!!!! Some wishful thinking, huh! My family is hardworking and always on the go. So, clothing convenience really matters a lot to us. We run this family furniture for over 15 years, and our carpenters and other employees do come and go. Even my father who had retired from the Navy has been doing carpentry works for the business and now that we run our own store, we want to always be flexible and comfortable. My sister and I are shoe persons. We indeed have more than a dozen pairs of shoes, from rugged to lady shoes. The men in the family, including my kids have their fair share of leather shoes too. We have indeed invested much on quality shoes. I don't think it is a waste to invest a good money on something that is worthwhile. We are into extreme adventure too, and the right footwear matters a lot. I found this Boot that I like for my airsoft game. It is from a top brand that means quality and comfort. It is also supported with other product line from other top brands and companies that everyone knows. Forsure, my partner and his friends would love the designs of these good boots for their military uniforms. I checked their site, and I found a good pair of jogging and climbing footwear. I hurt my feet the last time I used my old running shoes on a mountain climb of more than 13 hours. And from that, I have been scouting for a good pair of comfortable climbing shoes. I can ask my in-laws from States to order this good pair and ship it here in the Philippines. The site accepts online orders with free shipping. So, this can be an acceptable offer to my family.Hurray!!!! We are scheduled to climb to the tallest mountain here in Sarangani Province. I can't wait to have this new set of climb shoes! I have been a teacher for over a decade.WOW! That is quite long now.hahahhah! But one of my disappointments is not teaching my own kid. I usually envy mothers who have the choice to stay at home and take care of her family. But now, that my own kid is already into schooling, I find it very frustrating that I couldn't have the time to really help him all the time. I manage to help him through his assignments and prepare reviewers for his exams. But, those things not enough. I only wish I can do more for him. I love jewelry, and I love it a lot. I have a wide collection of earrings, bracelets, necklaces and rings. I complement them with my choice of fashion and mood and usually they get a lot of praises and attention. But I always want my jewelry to be classy, unique but not at all expensive. I normally jump from one website to another just to search for the right jewelry. I am fortunate to find this site with wide collection of sterling and copper jewelry. They even have Homemade jewelry cleaner solution that can help you clean your treasures at home at very minimal rate. This is really what I need to keep my things last longer. I began helping my sister, Tammy to do her blog and the works needed to at least monetize it.Hehehehehhe! We started her first paid review last night. She still struggled like the first time I did my blog, but as I worked through my blogs, I learned in the process. My other blogger-friends were that helpful too. So, now that she is into blog monetizing, at least, she earns.Heheheheh! Go! Go! Go sis! I easily get infection from scratches or little injuries, but I couldn't find any skin medicine that will sooth and heal faster. This is also true for my kid. We seem to share the same allergy or something. So, I began researching for a medicine that will do wonders, I came across of 7 Cream with Manuka Honey that can heal skin problems easily and with natural ingredients like manuka honey, aloe and natural oils that help do the healing. This is sure worth the try! One grateful side of blogging is meeting new people. I have met countless bloggers of different identities, some were normal while some were abnormal like me. Hahahhahah! But when Sir Avel known as Bariles left me an invitation to join the MBS2, I was just elated to join everyone and had the fun of my life. I then came to know Bariles in the flesh. He is indeed a big man, I was quite hesitant at first to rant and all with him. He invited me and few GenSan bloggers to help him set MBS2, then the rest was history. Indeed MBS2 was very successful if not for the efforts of this very energetic, dedicated person! The local government of GenSan is very very lucky to have a very committed and enthusiastic public servant. Gatikal lang ba ko?hahhahaha! The Grandfather of Soccskarsargen Bloggers, the Birthday Celebrant, the Gwapong-Makarismang si Sir Avel!Burger! Burger! Burger! I never really knew a blogger, and now a good friend who is as passionate as Sir Avel. He is passionate of blogging, food and fun.hahhahaahh! And we usually join him! We had our second get-together last Christmas when Soccsksargen Bloggers had the party. There were very few attendees but Sir Avel, had managed to make the party a blast. Now, those who missed it had sure missed the fun and the singing Sir Avel had orchestrated well.Hahahahah! He is friend to everyone. One can't miss this person who exudes charm, wisdom and character. And Jan. 19 is his birthday, he sure has a big big party with all the VIP's. A man of good character only begets countless friends. My family and I can only wish him the very best. He has touched many lives not only us Soccsksargen bloggers but everyone who loves Gensan. Indeed, he is now Soccsksargen bloggers' GRANDFATHER-ORCHESTRATOR! HAPPY HAPPY BIRTHDAY SIR AVEL!We love you! It has been a couple of Sundays that I spent my time with my professor and classmates instead of my family and having rest and fun. Sigh! Now, I have to hit the road again and travel to another city for my masteral class. I slept very late last night, working on my JAVA database program, and I couldn't actually make it run.HuhuhuhU! I am really very old and drained for all these works! I have to miss my ironing and laundry and lecture making among other things because of this schooling on a Sunday. Waaaaaaaaaaaaaaaah! When did they invent masteral schools anyway?Tsk!Tsk!Tsk! Yearn to be More Popular? There is new social network that not only allows you to meet new friends, but this also gives you the opportunity to share and sell and buy practically almost everything. I then have the idea that I can sell the stuffs of my store here.Hehehheheh! I just had my masteral class earlier in another city and we were given our IT project due before the semester ends. This is really putting much pressure on me as we have another pending JAVA database project. I wish to finish at least one, before the other one is due. My oh my! I was also told that my kid and nephew will have their monthly summative exam. This means I have to prepare their review test papers. Waaaaaaaaaaaah!!!!! And tomorrow, in spite that it is Sunday, we are required to still come to our masteral class for our last session and then come Monday- to- Friday of lectures and more papers. Sob!Sob!Sob! Social sites are everywhere and they usually come free. For one there is twitter where you meet a lot of people, like ted on twitter. I am also hooked to Friendster, MySpace, Zorpia, and etc. hahahhaha! It is just fun to meet old friends and new ones regardless of whatever medium it is. I have been the adviser of our small school paper since I was hired last year. This is my other role, among the many things I am! Hahahhahaha! It was harder to invite young students to write. It seems that with the present times, writing with better grammar and skill is not anymore natural among college students. We had a very responsible editor-in-chief but we had a very few writers and contributors. I am not an expert in English as I was only appointed to do this job and no one would accept the dirty works! Hahahahahha! But, in spite of my lack or incompetence, I really had hard time correcting their articles. So to add to my countless works to accomplish, this is my other responsibility. I really love writing, but somehow, I only have very limited time to do all. We are done with one paper and another one is due before this semester will end. I only wish I can complete everything with ease and quality! Some superwoman, huh!? Hahahhahahah! Whew! I only hope more and more skilled writers will offshoot in the coming semesters! Do you ever wish that you are just on a beach, just savoring the breeze and tranquility of the sea? I always do that, just to make my restless head slow down, and appreciate what life has brought me. Amidst our busy days, we seem to ignore what really matters to us, family and life. When I was younger, I only wish to become a teacher, mother and wife. Now, that I am all that, I have this nasty habit of pushing myself to achieving and acquiring more at the expense of who are really important. Then, I began forgetting my self again, depriving me of sleep, fun, and life. Tsk! Tsk! Tsk! For what do we really live for anyway? Who Doesn't Need a Printer? I am an IT person and have been one more than a decade ago. You can say, technology is my life! The family is quite hooked to it too. We have more than three PC's now but with one printer only. My other siblings and the store make use of these units pretty often, that we couldn't do much if our PC is done or worst, if our printer gets nasty again. But, who doesn't a printer anyway? You may have a number of computers at your disposal, but if you need a hard copy of anything, just exactly, how would you do that. Picking the right printer make require, of course, a lot of criteria to consider. One can check on the brand that somehow connotes quality. One can also check on the price and the printer's features that somehow meets his or her unique needs. We had tried a lot of printers. My first ever printer was an HP and indeed, it lasted over the years. Now, there are a lot of HP models, specifically, there is Hewlett Packard Laserjet 4000 that guarantees quality printing. They can be purchased online and be shipped within 24 hours! Now, that is quite fast! But more importantly, they come at more reasonable prices, much cheaper than other online stores. My partner's first set of printers include a Canon. With more affordable price range, one can make this a suitable alternative. We have been buying online for our gadgets and they sure are at their best quality. The DELL laptop we last bought in 2002 is still working to this date. And the latest purchase we had was our ACER notebook. All these were just shipped to our doorstep. But, we sure need an additional printer to station at home. We would surely consider this site for our next buying. We will recommend this too to our family abroad so they will buy from this great website in the near future. It will surely mean savings from the price differences these great printers cost. This is a German website, but I made use of a website translator to help me go through their products and I just love their cost-busting product lines! I have been wanting to overhaul the design of my two blogs but resources and time wouldn't allow me at all. But what the heck, I would never have the time anyway with all the stuffs I have been doing: schooling, teaching, programming, business, and designing, blogging and etc. . . hahahahhaahha!!!!! Some superwoman, huh!? hahahhahahah! I just love this new designs, love the colors and all. It exudes life and class!!!! Thanks Ivy!You are one chic designer indeed! We had been busy designing crafts for earrings, necklaces and bracelets to start our 2009 edition. So, today we made good sales in our school as I brought them for query and customized orders. Do check few of the things we made. Your critique will help us improve. Thanks a lot! Part of my personality is my versatility. I seemed to be passionate on whatever work I set my focus on. Conclusively, while I drive everyone me nuts for being demanding or bossy, I usually get results with flying colors! I did well before academically and teaching has been my true love, had tried to become a programmer, writer, and an administrator but it never crossed my mind to become a businessperson. Now, my teaching has become my secondary work only. I usually consumed much of my free time, how to spice our store and to design shirts and accessories. Indeed, I am workaholic even in my dreams. Hahahahhahah! I still see myself teaching when I grow old but I want to venture on other more challenging stuffs, like making our store well known and go global. WOW! That is a vision, I will of course, see real actions! When I first arrived General Santos City, I would jog with my sister early morning around Oval Plaza, read only good best seller books, watch my fave movies and just spend time with my son. But, with all the restless calls from work, school, and business, I was cut to just sitting with my desk and paper works.Sob! Sob! Sob! I am most of the time breathless, in short, drained and burn out! I am usually enthusiastic with any task to me. Some say, I am workaholic, while I call it passion. Hahahahhahah! So today, after weeks and months of no exercise, after my tummy has gone wider and bigger of holidays and immobility, we decided to jog again (after several procastination).Hurray! I just hope, I can sustain this again. We dont masteral class today, so I am maximizing every minute for a more worthwhile activity. Jeez! Hahahahahah! In the coming months, I will sure be all drawn to completing requirements and projects. Goodness! Where can I buy energy anyway?Hahahahhahah. Living in a tropical country like Philippines has allowed me to view vast areas of golf greens. They may tell that this game is for the elite only but I would rather contradict. This is one of the games for individuals where you beat not primarily your opponent but yourself. With various golf fields in the Phillipines, I can say, this game has become very popular. I never tried playing golf but I am fascinated by the equipment, clothing gears, and character that exude from the game. I love to see the different clubs. I indeed wondered how each club differs from the others. So, I began reading about them. A golfer may improve his score by using the most appropriate club to improve speed and correct flaws while playing. A novice golfer's equipment include set of clubs which consists of drivers, wedges, putters and irons. Apart from these basic equipment, a golfer must bring various accessories to make his or her game more convenient, and effective. Some accessories may be for looks while others serve a significant function. One must however bring a club bag for him/her and or his/her caddy, and of course, the golf balls. A golfer must use a good set of golf shoes to stabilize him or her while playing. Other accessories include golf gloves, caps, covers and more! Now, even Filipinos can check golf information and buy online for these golf equipment and accessories. Now there is one German Golf shop website that can cater to our golf needs, may it be information, game tips, accessories, equipment, holidays and more! This Golf shop is the widest German shop there is. The site offers vast collections of clubs, wedges, putters, cart and stand bags, shoes for men and women and kid golfers! WOW!!!! What is more? They offer also travel golf accessories, should you want to play with your own stuffs. You can score well if you play with your equipment, right? The site is in German, but with online translator, I was able to read well all the great collection and services this shop offers. I can even contact their golf expert for consultation. Now, who can beat that? This game is soon to be in my list for adventure! Last weekend, my siblings and I headed to Davao City for Samal Island experience. I had been hearing only good things about this place but failed to actually be there. So, in spite of hectic schedule and piled back works, we managed to hit the road and the green waters! We had approximately 4 hours of bumpy travel on the road from GenSan City and on the barge from Davao City wharf to Samal Island. We didn't mind the travel as we were more excited of what we should experience and savor from the trip. And, blessed we were, that we indeed had so much fun. We arrived late in the afternoon and just hit the waters until 10 pm. Yuri was almost inseparable from the sea. The sand was all white and fine, the waters all clear and the surrounding was all green. We just brought our tent with us. So, it was indeed a nature's trip! The place was almost exclusive, so you get to enjoy the beach with very few guests. We wish to come back with the entire family and stay longer. We only regretted that we stayed on this beautiful of Isla Rita for overnight and headed back to our home.